Those with Alzheimer’s Disease live an average of eight years after their symptoms become noticeable to others, but survival can range from four to 20 years, according to the Alzheimer’s Association. 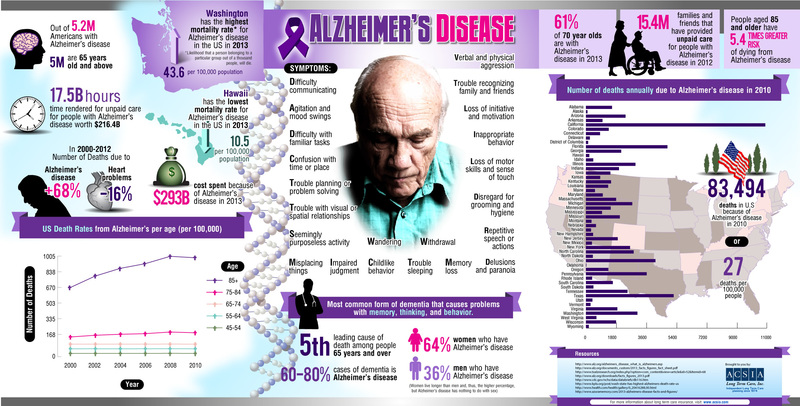 In 2013, $293 billion was spent on Alzheimer’s Disease, and it is the fifth leading cause of death among people 65 years and older, according to a new infographic from ACSIA®. This infographic also includes symptoms, costs, heightened risks, rates of death and more. You may also be interested in this related resource: Alzheimer’s Disease Evaluation and Management. This entry was posted on Friday, October 25th, 2013 at 1:30 pm	and is filed under Disease Management, Health Information, Infographics. You can follow any responses to this entry through the RSS 2.0 feed. Both comments and pings are currently closed.